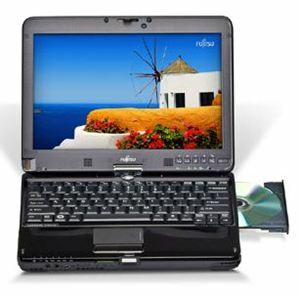 Fujitsu has unveiled its new tablet PC which is known as LifeBook TH700. The LifeBook TH700 has been featured with the latest dual digitizer technology with pen input and multi-touch interaction, modular bay, bi-directional display hinge and the performance of all new 2010 Intel Core processor technology. The new tablet machine is being designed for enhancing the mobility experience. Display – 12-inch WXGA LED backlight display. Processor – Intel Core i3 350M Processor (2.26 GHz, 3 MB L3 cache). Operating Systems – Genuine Windows 7 Home Premium (64 bit). Digitizer – Dual digitizer (pen input and capacitive multi-touch screen). Webcam – Built-in webcam with dual digital array microphones for video chat. Video – Intel HD Graphics. Memory – 4 GB DDR3 1066 MHz SDRAM memory. Hard drive – 320 GB S-ATA 150, 5400 rpm hard drive1 (protected by Fujitsu Shock Sensor). Communication – Gigabit Ethernet LAN. Wireless – Integrated Atheros XSPAN 802.11 BGN (b/g/n) wireless and Bluetooth enabled. Modular bay with quick-release latch – Modular Dual-Layer Super-Multi DVD writer. Security – Embedded fingerprint sensor. Interface – Full-size, spill-resistant keyboard with touchpad (includes scroll sensor). Port – High-Definition Multimedia Interface (HDMI) port. Battery – Lithium ion (6-cell, 5200 mAh) battery that supports up to 5 hours of battery life. Software – Preloaded with Microsoft Office Starter 2010. The Fujitsu LifeBook TH700 with dimensions of 11.69 x 9.17 x 1.51-inch and weighs 4.2lbs is now available at Fujitsu online shop for the price of $1099 after $50 mail-in rebate.